Andrew Dowling is a lecturer in Catalan and Spanish history at Cardiff University. He researches on the contemporary history of Catalonia. He is the author of various articles in these areas including ‘Convergència i Unió, Catalonia and the new Catalanism’ in Sebastian Balfour (ed. ), The Politics of Contemporary Spain (Routledge, 2005) and has published in journals including the Journal of Contemporary History, the International Journal of Iberian Studies and Catalan Review. He also contributed articles on Catalonia for Immanuel Ness (ed. ), International Encyclopedia of Revolution and Protest (Wiley-Blackwell, 2009). Catalonia since the Spanish Civil War examines the transformation of the Catalan nation in socio-economic, political and historical terms, and offers an innovative interpretation of the determinants of its nationalist mobilisation. With Franco’s and Spanish nationalism’s victory in 1939, and the consolidation of a long-lasting dictatorship, it appeared certain that the Catalan national movement would be crushed. Yet, this did not happen and Catalan nationalism and identity reemerged at the end of Franco’s dictatorship in 1975 more firmly rooted than before. The core of Reconstructing the Nation traces the Francoist repression and the nationalist response to it, demonstrating how new political actors reconfigured Catalan nationalism over the course of the Franco regime (1939–1975). Post-Franco, Catalan cultural and political identity was consolidated and Catalonia became the most successful state-less nationalism in western Europe. The 21st century has been marked by an ever-growing independence movement, culminating in the vast demonstration in the city of Barcelona in July 2010. Andrew Dowling provides multi-faceted viewpoints in historic perspective, and reflects on possible steps and outcomes for this new pro-independence turn in Catalan nationalism. This study will appeal not only to students of Spain but also to those interested in nationalism as a separate issue of enquiry. The themes treated in the book – Franco’s Spain, nationalism, anarchism, Catholicism, communism and the Catalan role in Spain’s transition to democracy – make this work an essential point of reference for students and researchers in Hispanic studies, modern European history and political science. 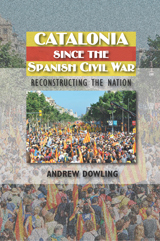 Andrew Dowling not only offers one of the few overarching accounts in English of Catalan nationalism, but he also presents important new research on the resurrection of the nationalist movement under the Franco dictatorship, in addition to incorporating the very latest exchanges in the ongoing debate on the future of Catalonia. Catalonia since the Spanish Civil War is an excellent and a well-balanced study. This is a study that is as valuable as it is necessary ... rigorous and indispensable. Reviewed in Italian, Spagna contemporanea (2014).